Social pressure to feel happy can actually have the opposite effect–and might contribute to the prevalence of depression–according to recent research. “If we fail to live up to that, what effect does it have on us?” asks Bastian, associate professor in the University of Melbourne School of Psychological Sciences. In a recent study in Depression and Anxiety , Bastian, Belgian collaborator Egon Dejonckheere, and fellow researchers sought to examine the relationship between the social expectations not to experience negative emotions, and the occurrence of depressive symptoms. A sample of 112 individuals with elevated depression scores took part in an online daily diary study for 30 days in which they responded to questions designed to measure their depressive symptoms (low mood, fatigue, agitation, lack of concentration) and the extent to which they felt pressure from others not to feel depressed. Statistical analysis of the responses showed that the more a participant felt social pressure not to feel sad or anxious, the more likely they were to show an increase in depressive symptoms. The study provided important new insights into factors that predict whether people feel depressed on a daily basis, and it appears that a person’s social environment—the culture they live in—plays a central role in determining this mental illness. “Traditional depression research generally focuses on the role of person-specific characteristics, meaning that researchers look at genes, biomarkers, cognitive and behavioral styles. But the findings from this study suggest that external cultural factors are also at play,” says Bastian. The pursuit of happiness at the expense of its counterpart emotions was the focus of another recent study of Bastian’s. It looked at the causal relationship between social expectations and increased rumination—a focused attention on the symptoms of one’s distress, in response to failure. After reporting their current emotional state, 120 participants went into one of three experimental conditions to complete a task: solving 35 anagrams in three minutes. What the participants didn’t know was that half of the anagrams had no solvable answer, which meant they were obliged to perform poorly and experience failure. In the first condition, participants entered a small room decorated with motivational posters and books where an upbeat host asked them to complete the task. The second scenario involved a neutral room and the same task; while the third condition involved the happiness paraphernalia but this time participants were given anagrams that were all solvable; they did not experience failure. Upon completion of the task, the participants performed an exercise in which they were asked to focus on their breathing. If their thoughts strayed, they were asked to describe the thought and its frequency. Researchers found that participants in the first condition—the “happy room” with the unsolvable anagrams—dwelled on their failure more than the participants in the other conditions. “In eastern—particularly Buddhist—cultures, people aren’t happier than their western counterparts, but they are less depressed. 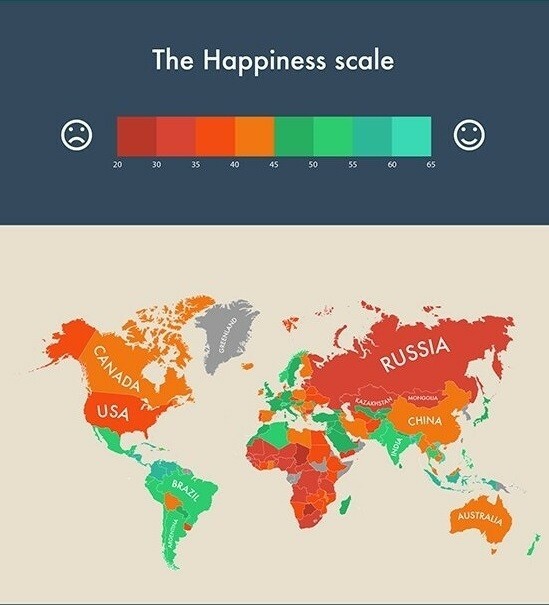 This over-emphasis on happiness we see here doesn’t happen in those countries in the same way and they seem to embrace a better balance of the whole emotional repertoire. Bastian proposes that in a clinical setting, psychologists can make their patients aware of this societal pressure to be happy so that they can better choose how to react to it. When scrolling past all the smiling faces on Instagram, they can remind themselves that others are also trying to present themselves in a positive light. On a societal level, Bastian would like to see education programs that de-stigmatize feelings of sadness and anxiety and challenge people’s prejudice towards mood disorders. “We’ve become so used to people following this social norm of putting their best foot forward and not showing vulnerability. So when a celebrity announces that she’s suffered a miscarriage and is taking some time out, or a politician takes leave to deal with the stresses of the job, it resonates so powerfully with us. This stuff is the gritty truth of life and sharing it doesn’t bring people down, it connects us,” says Bastian.